We will not be able to attend this year as our oldest is getting married in August and we will be swamped with preparations. It's kind of hard to believe we are that old! 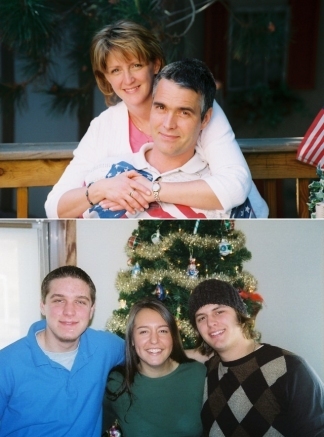 In the photos: my husband Jim and myself, our son Ben and his fiance Katie, and our son Josh (in the blue). My husband is still running his HVAC business in here in the Brainerd Lakes area and I work at the Aitkin Hospital in the Health Information Dept. Our son, Ben is currently interning at a church in Hastings and will graduate next year with a degree in Children and Family Ministries. His fiance attends Argosy University in Eagan for Dental Hygiene. Our son Josh is living and working in Fargo, ND.